To completely remodel the interior and exterior and extend a small 3 bedroom 1950’s fibro cottage into a new and timeless family home that complimented the surrounding homes in the suburb. The design brief was to maintain the bones of the cottage and to create what looked like a new home with large open living areas that flowed effortlessly to the outdoors. The clients wanted to utilise every room in the home and requested separate living zones that met the needs of their growing family together with a home office that offered a separate entrance to the home. Construction began by retaining the shell of the old cottage and removed the asbestos fibro cladding and re-clad the walls with polystyrene cladding. This was chosen because of the benefits that included ease of installation, energy efficiency and the ability to achieve a modern façade. The house comprised three different construction types of cladded frame, brick veneer and double brick. With supreme quality of rendering we were able to achieve a rendered surface that matched the overall project. The original cottage consisted of three bedrooms, lounge, original kitchen, laundry and bathroom and was situated on a narrow, yet long block. The extended and remodelled home consisted of 4 bedrooms, study, master suite consisting of a walk in robe and ensuite, formal lounge room, open plan galley kitchen, dining and family room, rumpus room, main bathroom, powder room, walk in linen cupboard, laundry, private courtyard, large entertaining deck, large double garage with loft style storage, adjoining home office and bathroom and a single brick carport. 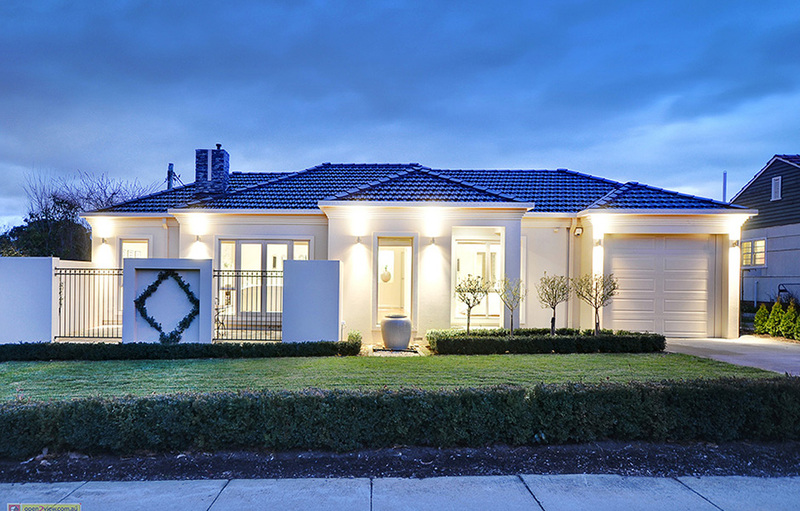 The clients were thrilled with the end result, the realisation of their dream home. The brief was met, there were separate living zones that met the needs of all the family; together with one large open, light filled living area that opened onto a beautiful outdoor deck through large stacked alfresco doors, perfect for entertaining. The home office was separate to the home offering external access for clients. The quality and finish of the home was superior with features including rosegum timber flooring, quantum quartz benchtops and two pack polyurethane joinery throughout the kitchen, bathrooms and laundry together with floor to ceiling tiling, a stacked marble fireplace, terracotta roof tiles and a stacked slate letterbox. The home that was created boasted style with an understated elegance that will stand the test of time.